The timeless nature of the Cessna 182 is shown in this 2009 picture of a 1956 model – ie, when it was already 53 years old. One of the big challenges we must consider and confront is how we would manage to get from our normal residences to our retreats if/when a major disaster is about to occur (or has already occurred). The ideal choice is, of course, to simply hop into the family car and drive there normally. But doing this would only be possible if you were able to anticipate any such disasters and get all the way to your retreat some hours before anyone else started to react the same way, and before the roads started to clog up with vehicles and become a giant solid unmoving parking lot. In the best case scenario, you could do this; indeed not just in best case scenarios but also in more generally anticipated scenarios too. We discuss the likelihood of traffic congestion interfering with your ‘bug out’ activities here. Nonetheless, as a prudent prepper, you need to consider not only reasonable scenarios but unreasonable scenarios too. And planes can be useful not just for avoiding road congestion, but for other reasons too. A plane can of course get you anywhere quicker than any vehicle can. A plane can allow you to delay your decision to bug out, because you don’t need to be so concerned about beating the traffic. Sometimes it can be advantageous to delay a decision as long as prudent, and if you have a plane as a transportation option, you have more time up your sleeve. A plane gives you another route to where you’re going. Maybe the roads are closed due to bad weather or as a side effect of the situation that triggered the crisis. An earthquake, for example, might have caused bridges to fall, a volcano erupting might destroy roads with molten lava runs. Weather issues may have a much greater impact on travel by road in a Level 2 or 3 scenario. For example, if a road is washed out, it may not be repaired again. Or, if a heavy snowfall occurs, there might be no snow removal crews and no snow removal equipment to clear the road, causing it to remain closed all winter long. While planes are also weather dependent to an extent, the type of weather issues that affect them are short-term rather than potentially 3+ months in duration, and they give you a second chance in the game and more ways to get from where you were to where you want to be. Most planes don’t have more range than a car with lots of additional gas tanks, but their speed means that what might be a two or three day journey by car can be done comfortably in a single day in a plane, with just one take-off and one landing. Because plane travel is not dependent on roads, you never run the situation of ‘you can’t get there from here’ – you simply fly directly, the shortest way you wish, between any two points, whereas the roads underneath you might meander around and detour through dog-leg loops, adding hundreds of miles to your journey. Planes travel is also safer – you’re not going to get speeding tickets or otherwise hassled, whether by law enforcement or other drivers and onlookers while flying through the air. We offer this suggestion completely seriously. If you live not a long way from a general aviation airport (ie one where private planes can be stored, and where they fly in and out), and if the budget allows it, consider buying a private plane. A plane as a bug-out-vehicle has the huge advantage that it is not likely to suffer congested roadways. On the other hand, it relies upon some infrastructure being in place both where it will depart from and where it will land and provides a somewhat weather-dependent means of transportation. It also has limitations in terms of how many people and how much cargo it can carry (assuming you get a small single engined plane) – although maybe you can ferry people and materials to your retreat in two or three journeys if you can’t fit everything you must get into the plane for a single flight. Maybe both your normal residence and your retreat is closer to a lake than to an airport (or to a sheltered bay in the ocean). In such a case, a float plane is better than a regular plane, because whereas airports can experience problems (for example an earthquake which rips up the runway), and may even be operating under emergency air traffic control restrictions that impede private flying, lakes have no such problems at all. Float planes are more weather dependent, and also become more limited to daylight hours of operation only, so there are trade-offs to consider and evaluate. Note also that the most important issue is the proximity of a suitable lake or airport to your normal location. It doesn’t matter nearly as much at your retreat. This is because we are assuming it may be very difficult to travel from your home to the airport or lake where the plane takes off from, but it will probably be comparatively easy to travel on from where you land to your final retreat, due to it being in a low density rural location where the roads are unlikely to be jammed full of people urgently trying to get out of town. It is much more practical to plan to drive the last 5 or 10, or even 50 or 100 miles to your retreat once you’ve got out of and away from the major population centers. You need to take to the air to get out of the cities, but once you’re in a rural setting, you can more comfortably plan to complete your journey with relatively few problems by some type of automobile. Note also the Code Green Halfway House – maybe your objective is merely to fly to the Code Green Halfway House, at which point you can then retrieve a backup vehicle, freshen up, and complete your journey the next day. If you are driving by car to your retreat, you’ll be traveling at the same speed as everyone else who is also evacuating the city you live in. You’ll be potentially at risk from the people in the cars all around you every minute of your journey, and they’ll be ‘with you’ every part of the way. And when you finally arrive at your retreat, you might find some unwelcome and uninvited strangers have already got there before you! But a plane gives you two huge advantages. The first advantage is that you’re flying at 120 – 180 mph rather than driving at anything from 0 – 70 mph, depending on traffic. The second is that you’re traveling quite literally ‘as the crow flies’ – in a straight line, the shortest route possible. These advantage combine to help you get where you’re going massively more quickly, and apart from the vulnerabilities getting to the city airport you fly out of, the rest of the way is comparatively safe. Planes are not as expensive as you might think. While you can certainly spend over a million dollars for a plane, older planes can be had for as little as $50,000. 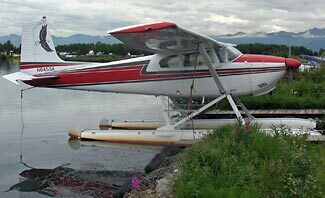 A 30 – 40 year old single engine Cessna 172, capable of carrying four people (ie a pilot plus three others) and a little freight (depending on passenger weights and how much fuel is loaded) up to 850 miles on a full 56 gallon tank of gas, while cruising at 140 mph can probably be purchased for something in the range of $50,000 – $75,000. Newer, larger, faster planes, and with more range, of course go up in price, but you can still get something good for $100,000 or less. Airplanes are subject to strict maintenance, inspection and certification requirements, and are also flown many fewer hours each year than a car is driven. You can buy an older plane with much more confidence than you would an older car. You’d of course need to get a private pilot’s license, and you might want other family members to get one too in case you’re incapacitated, and for more overall operational flexibility. Learning to fly is more complicated than learning to drive, of course, but 80+ year old grandmothers have learned to fly, as have 15 year old teenagers, and every type of person in between. Consider getting another couple to buy into the plane with you. A four seater plane can hold four people, after all, and one of the key things you want to do is to have more people in or adjacent to your retreat than just yourself. There is safety in numbers, and if those same numbers can also reduce the cost of buying and maintaining a plane, so much the better. You need a plane and you need somewhere secure to store it at your home airport or lake. You need a private pilot’s license. You’ll want to keep the plane fully fueled, and if you might be ferrying passengers and supplies on multiple flights, you’ll want a supply of fuel at your destination and possibly top-up fuel at your home base as well (depending on how far the plane must fly for each roundtrip). You’ll also need a vehicle and somewhere secure to store it at the place you’ll be flying to. Most airplane engines run on a special type of ‘av gas’ but some planes and their engines can be adapted to run on regular automobile gasoline. If you had your plane modified for regular auto gasoline, it would be more versatile and easier to refuel in the future. Although you’d want to make use of the latest GPS and avionics, be sure you can navigate without GPS because many worst case scenarios involve the loss of GPS service. This article has proved popular, and we’ve now added a second article with much more information – More on Planes as Bug-Out Vehicles.